Experience the unparalleled, creative side of Las Vegas. 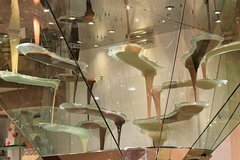 From the stream of flowing chocolate circulating in the world’s largest chocolate fountain to the rare exhibit of ice columns, you will be immersed in the world class art, attractions, and the architectural splendor of the Central Strip. Meet your guide in the Aria hotel registration lobby near the main entrance. Your narrated guided tour will take about two hours and will terminate at the starting point. You will see treasures and attractions along a two mile walk unparalleled in creativity, opulence and accessibility. Enter James Turrell’s world acclaimed light and space installation. Feel the ice of Glacia. Watch the twirling columns of water art. See 26 foot rose, $10,000,000 Chihuly ceiling. Give to fat Buddha a coin for good luck. Find your lucky number on LED "treasure pagoda." Visit Richard McDonald's Gallery of Cirque du Soleil fame.